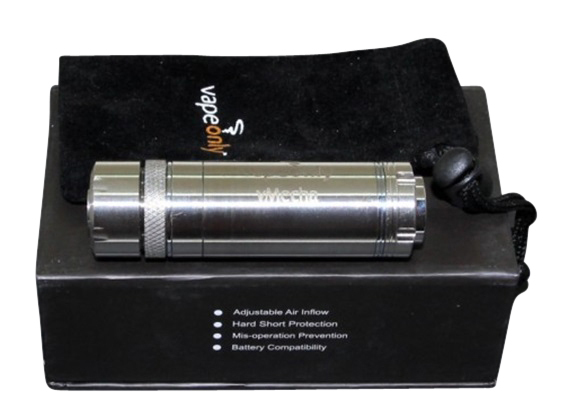 Vapeonly vMecha Stainless Steel Telescoping fully Mechanical MOD. This MOD is packed with features not seen in most mechanical MODs. Features locking fire button, adjustable airflow control, deep recessed eGo connection with trim ring, and built in safety fuse. The vMecha has a telescoping body so you can use any 18 series battery such as 18350, 18490/18500, and 18650. Built in hard short protection. The device has a built in safety fuse circuit to protect the battery against a hard short and prevent the hot spring from collapsing. Compatible with any atomizer/clearomizer/tank with a 510 or eGo connection. The unit does not include a battery or a battery charger.